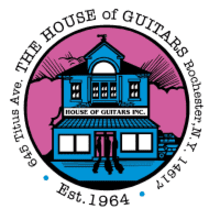 Billed as “The Largest Guitar Store in the World,” House of Guitars, Inc. is the located in Irondequoit, New York, a suburb of the city of Rochester. The store is known for its extensive anthology of vintage guitars, amplifiers, vinyl records, cassette tapes, compact discs, music videos, T-shirts, and countless other rock memorabilia that spans the last 52 years! “For the Rising Young Stars from Earth” is the official House of Guitars slogan, but many choose to refer to it as “The Store That Ate My Brain.” With the approval of people like Ozzy Osbourne and Les Paul, bands like The Who and Metallica, and a long list of others who have visited the store, it is easy to see why The House of Guitars is as timeless as ever. In numerous ads on late-night local television in the 1970's, it was insisted that “The House of Guitars is cooler than Hollywood.” Check out our store today and find out for yourself! All NY residents must pay NYS sales tax.